Kenny introduces us to some of the world's most original and influential thinkers and helps us gain an understanding of their famous works. The great minds we meet include René Descartes, traditionally seen as the founder of modern philosophy; the great British philosophers Hobbes, Locke, and Hume; continental thinkers such as Spinoza, Liebniz, and Hegel; and the towering figure of Immanuel Kant, who perhaps more than any other made philosophy what it is today.Kenny first tells the story of modern philosophy chronologically: his lively, accessible narrative brings the philosophers to life and fills in the historical and intellectual background to their work. It is ideal as the first thing to read for someone new to this wonderfully creative period. Kenny then backtracks to look closely at each of the main areas of philosophical exploration in this period: knowledge and understanding; the nature of the physical universe; metaphysics (the most fundamental questions there are about existence); mind and soul; the nature and content of morality; political philosophy; and God. 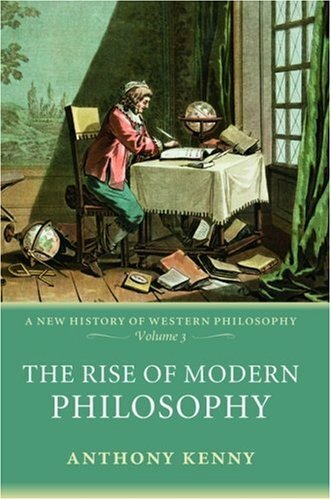 `The Rise of Modern Philosophy' is the third of four volumes in Anthony Kenny's `A New History of Western Philosophy' recently published by Oxford University Press. For those unfamiliar with the author, Kenny is a leading contemporary scholar that has previously written noteworthy texts on Aquinas, Descartes, and Wittgenstein amongst others.It is the second text in the series that I have read (I previously read Volume 1). 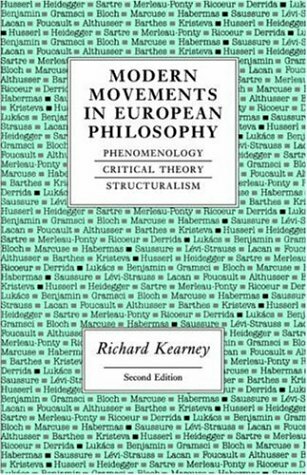 On the positive side it is the best single-author overview of Western philosophy of which I am familiar, more readable than Copleston and more evenhanded than Russell. Kenny is a talented writer with an impressive knowledge of the Western tradition, able to tell the story of philosophy is an integrated and insightful manner.As is becoming popular in introductory texts Kenny blends a chronological and subject matter approach, over viewing the period chronologically in the first third of the book then looking at specific subjects in more detail in the latter part (e.g. ethics, epistemology, metaphysics).This would seem to be a helpful approach to the newcomer; providing some important historic context before delving into specific material in detail. On the less positive side, while I feel Kenny's work deserves a wide audience I am uncertain if it will readily find one. Those with sufficient background to follow the discussion may pass on the book, while those unacquainted with philosophy may find that the text moves too fast and somewhat opaque.Indeed given the tremendous amount of great thinkers in this period and the limited space available some important thinkers get rather short shrift (e.g. Hegel).Finally, from a physical perspective the paper is glossy, giving it a `fluffy' feel and making it difficult to read it certain lightening conditions (reflection). Overall, this is a good work by an excellent philosopher. Despite some drawbacks it is a helpful book and I will likely pick up the remaining two volumes. 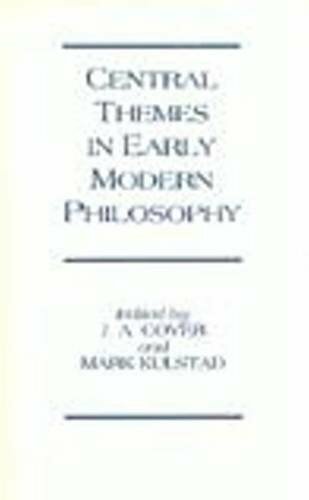 at a bit over 300 pages, this survey of philosophy encompasses roughly from the 16 th century on up to Hegel in the early 19 th century.the first 3 chapters are a survey of the thinkers of this time frame that made important marks on the philosophical scene.the rest of the chapters are broken up into themes taking a look at a particular concept; knowledge, physics, metaphsics, god, ethics, etc.,and how it was dealt with in the time frame considered. this is a good book, a solid study, but it is not for beginners.Kenny knows his subject, but while he may have been aiming for a helpful survey, he seems to assume too many things of the reader. 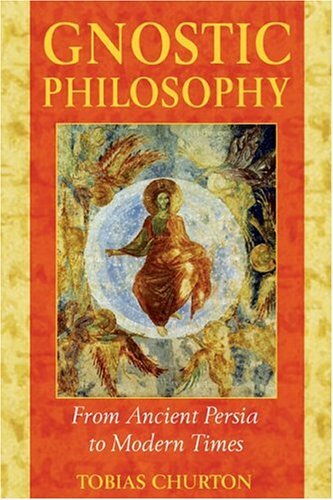 for someone coming to philosophical study new, this would be a rather arduous book to work through.for those already having a fair deal of philosophical study under their belts, this book is a well done tour and refresher of many of the main contours of philosophical thought for the time period it deals with. 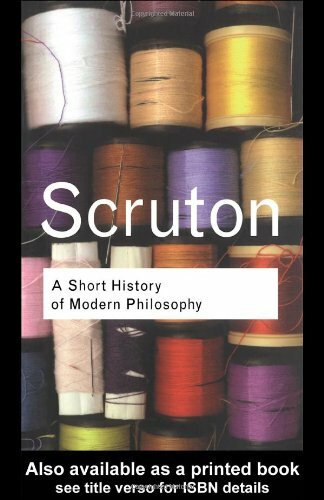 Whether you agree or not with his politics, Scruton has done an indisputably great job in this book surveying, expressing, and relating all the various currents in modern philosophy. He is especially sensitive to the modern divide of the science-oriented, analytic, anglophone tradition from the humanities-oriented, phenomenological, continental tradition, appreciating and criticizing each in turn. And it's an absolute delight to read, which is saying a lot for modern philosophy! I felt that all I learned in the 500 page summary was about Frege, Kant, Strawson, Descartes, Wittgenstein, Aristotle, and Russell.Maybe they were "Modern" once.One page on Existentialism.A couple pages on Nietzsche.One page on Deconstructionism under the the "Devil" chapter.Hardly anything on Marx.The chapter on the Soul never mentions immortality or God, just the mind. The chapter on Freedom never mentions Fromm.He mentions "American Psycho", but not Kristeva or Paglia. 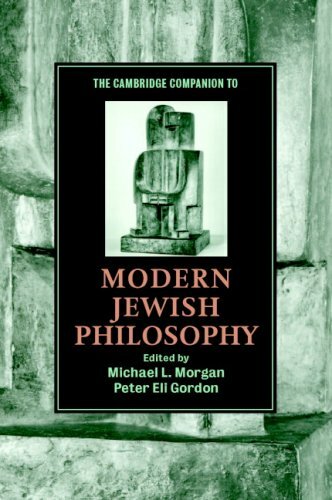 "Modern Philosophy" provides an excellent overview of philosophical thought. Ideas are organized thematically and relationally - not chronologically and hierarchically. The author employs a dialectical and evenhanded approach in which views and opposing views are presented, analyzed and synthesized. The reader is rewarded with many insights and "aha" moments. The book is well-written and very engaging. 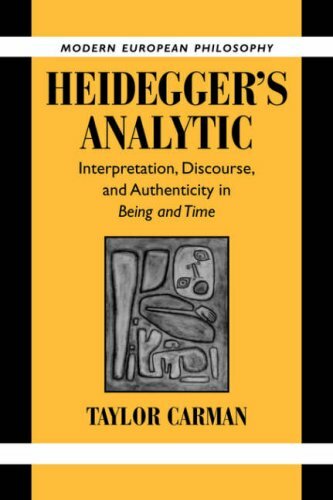 It is highly recommended for the individual who is seeking a thought-provoking survey of philosophy. This books leaves me with mixed emotions. 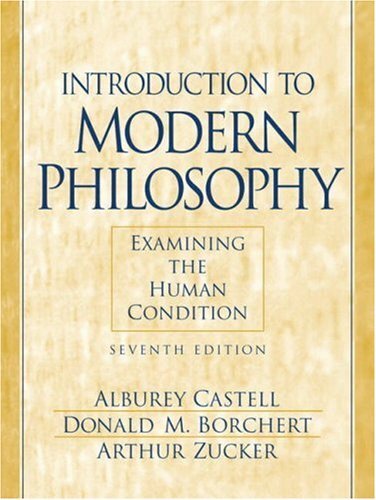 On the positive side, it's the only book I know of its kind, covering almost every topic of modern philosophy. And, for the most part, it is highly accessible and remarkably clear (philosophy of language can be opaque, but that's inherent in the field). On the con side, not enough attention is paid to ethics and politics (Scruton himself is somewhat of a conservative/communitarian), and the topic of aesthetics could have been more informative. Another con is that Scruton tells the reader in advance that his own opinion will seep into the discussion, but that he'll designate it as such. Well, yes, his opinion does creep in, but it's rarely distinguished as his own. Yet, for all these quibbles, I cannot imagine a better introduction to the discipline of philosophy as it is practiced in Anglo-American circles - but without the arcane and often obtuse language. It is remarkably broad in scope, accurate in depiction, clearly mapped, and fairly thorough for an overview. If one wants an introduction into how Angophone philosophy is practiced, I cannot recommend a better book. 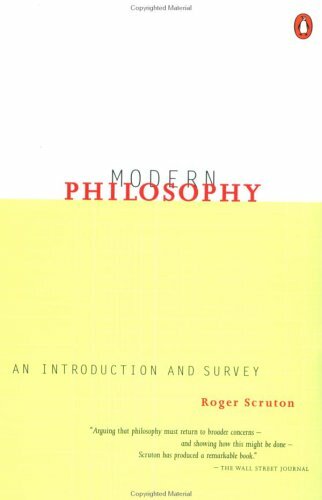 I purchased Scruton's survey as an first-year undergraduate student who was eager to learn just about everything there is to learn about philosophy, and it proved very useful to me throughout my undergraduate career.And it's heartening to flip back through this book and see that I've actually learned a good deal in time I've spent studying philosophy.Before long I may know enough to write a book of this sort myself--not that I have the patience or talent for exposition that would be required to do so. 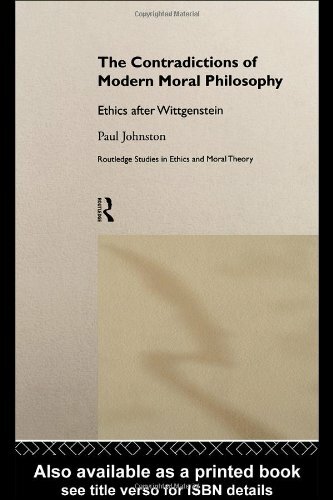 The aim of this book is to provide a synoptic overview of the concerns and central arguments of philosophy from the seventeenth century to the present.It covers, at least briefly, just about everything that modern philosophers talk about, it displays broad historical erudition, it provides the reader with a sense of how the concerns of contemporary philosophers connect to the history of modern philosophers, and its extensive reading guide gives the reader some helpful suggestions about where to go in the literature for further work on the topics discussed here.It is, moreover, quite good at introducing the basic issues and positions, both of contemporary philosophers and their early modern counterparts, in metaphysics, epistemology, philosophy of language, and philosophy of mind.And, although this isn't intended as a work of history, Scruton manages to present most of the major ideas of the most significant figures in modern philosophy (e.g. Descartes, Hume, Kant, Hegel, Frege, Russell, Wittgenstein, et al.). Scruton's subject matter here is broad, to say the least.He discusses just about every subject about which philosophers have had anything to say in the last four hundred years.This book has sections about God, about free will, about morality, about politics, about science, about knowledge and belief, about minds and their relations to bodies, about language and its meaning, about space and time, about mathematics, and about quite a few more things.Indeed, there's simply too much covered here for Scruton to connect all the material and provide much structure to this book.So it's perfectly fine to treat this book as something like a reference work, and to dip into whatever section one finds interesting while ignoring much of the rest of the book.But, for people with little background in philosophy, it would help to begin by reading the fifteen or so chapters straight through.These chapters, which comprise roughly the first third of the book, outline the basic historical and contemporary philosophical ideas that the reader needs to understand most of the rest of the book, and they constitute a pretty good introduction to the material in metaphysics, epistemology, philosophy of language, and philosophy of mind that you need to know to understand the rest of the material here. Despite Scruton's professed intentions here, however, this text is probably too complex and too compressed for the absolute beginner.Even working with five hundred pages of space, he's forced to cram quite a bit into a short space.Scruton acquits himself well, of course, but it's simply not possible to explain these things as thoroughly as beginners are probably going to need them explained.He tends to cover in twenty pages what most introductory books cover in two hundred.And while this makes his book an invaluable resource of information about philosophy, it also precludes the sort of patient exposition that might be necessary in presenting this material to beginning students of the subject. 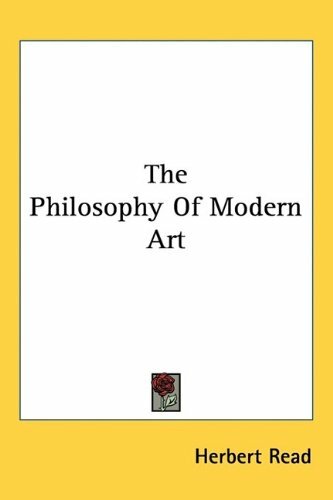 Gathers together the key texts from the most significant and influential philosophers of the late modern era to provide a thorough introduction to the period. Features the writings of Locke, Berkeley, Hume, Leibniz, Kant, Rousseau, Bentham and other leading thinkers. Examines such topics as empiricism, rationalism, and the existence of God. Readings are accompanied by expert commentary from the editors, who are leading scholars in the field. 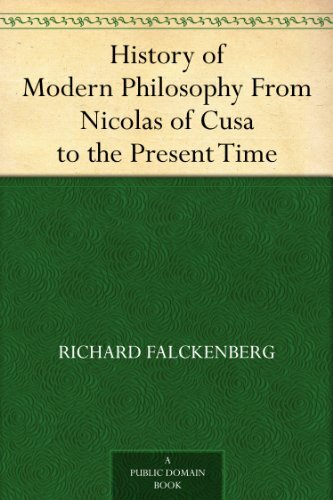 The leading anthology of its kind, this volume provides the key works of seven major philosophers, along with a rich selection of associated texts by other leading thinkers of the period thoughtfully chosen to enhance the reader s understanding of modern philosophy and its relationship to the natural sciences of the time. Texts are provided in their entirety or in substantive selections. there's not much to say about this because it's a collection but they did a good job at picking out the philosophers from that era. Because of a change of class, we were unable to use this book, but working with GreatGuyBooks on the return was great.Thanks again. 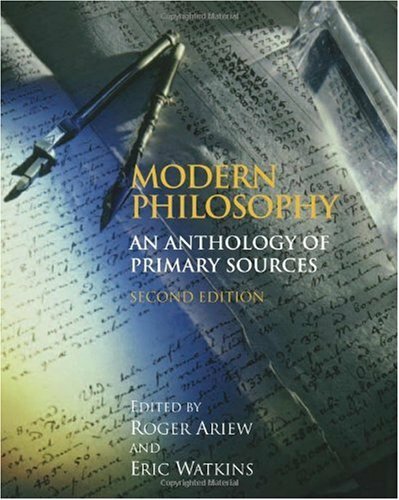 I found Ariew's anthology of modern philosophical texts to be very helpful. The compliation of various philosophers is concise and well put together. One thing I would comment on is the binding of the book, I wish the book was made in such a way that it was easier to preserve. However, the content included does justice to the beauty of modern philosophy (albeit some major texts from Spinoza's Ethics were excluded). 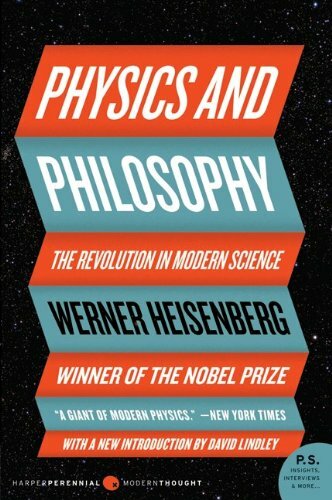 It is a fantastic read that includes major actors in modern philosophy whos ideas acted more as stimuli to the major philosophers of the era-thus Bacon, Galileo, and Newton affecting philosophers such as Descartes Hobbes, Leibniz, Hume and Kant. I would suggest this as a beginners anthology to those interested in the history and development of philosophy in the modern era. 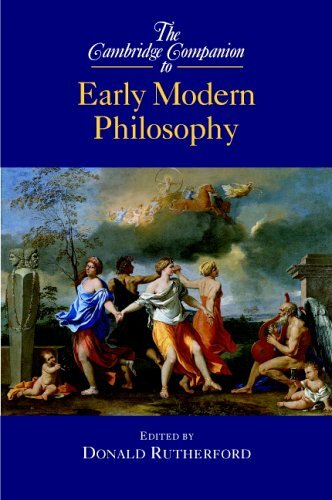 I used this anthology in the late 1990's for a course I was teaching in the history of modern philosophy.I will be teaching the same course in the Spring of 2009 and I will be using the same textbook.It is comprehensive.And students will appreciate the fact that it is relatively inexpensive.Hackett does it again! Great excerpts, good format, good reading. Philosophy surveys tend either to ignore important nuances and therefore become just plain wrong, or pay attention to those details and therefore become impossible to read.This book, however, manages to provide a robust introduction to each major philosopher of the modern period, along with some pieces of what came before it, in a very short, readable way. Scruton walks you through each philosopher's most important arguments, how those arguments come together into conclusive philosophies, and where those philosophies fit into the broader scheme of the whole history of philosophy.His clarity and brevity make this book accessible to any interested beginner, and his attention to important details in the flow of philosophy gives this book an audience within the ranks of the previously initiated.To put it succinctly:He both rigorously understands his subject and communicates very smoothly, which makes this book the absolutely perfect introduction. 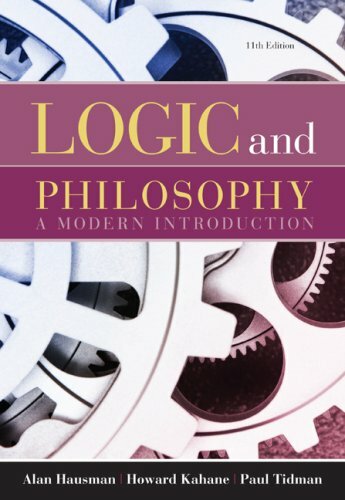 I recommend this book to anyone who wants to learn a whole lot about philosophy, and to any undergraduate who wants to ace his philosophy classes. I was convinced to buy this book by browsing through its chapter on Marx. Scruton's own political views lie on the Right, but his treatment of Marx's philosophy is among the best of this length that I have read anywhere. And that goes for other philosophers from Descartes to Wittgenstein who are discussed in this book. Scruton does not expect his readers to have any prior knowledge of philosophy, but neither does he patronise them. He expects them to think hard, and discusses the difficult points with great clarity rather than glossing them over. 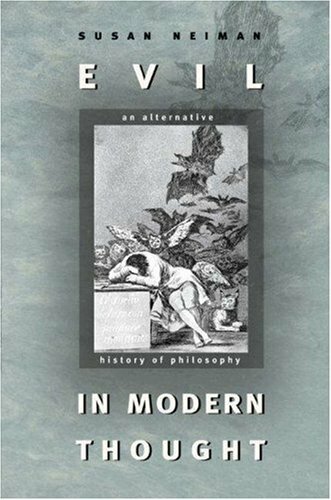 However, as the first chapter makes clear, this book is best seen as a historical introduction to philosophy rather than a 'history of ideas'. 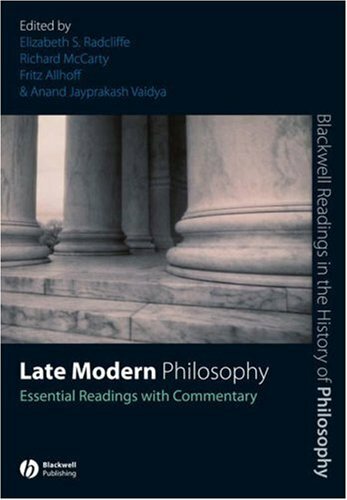 Those who wish to understand the evolution of philosophy in its social and historical context will have to supplement this book with other sources. Most interesting discussion in book is under Ch 4, Homeless.Previous chapters can be omitted.Author posits many pithy remarks, as in the following: "before it ever happened, who could suppose that human beings would be extinguishable like vermin (i.e. the Holocaust), or transformed into living bombs (i.e. September 11, 2001)." Dr. Neiman has produced a competent "history of [the problem of evil in] modern philosophy" from Leibniz to John Rawls.Speaking of Rawls, Neiman obtained her doctorate studying with him.Other relevant biographical information about Neiman is that she left home in her teen years to protest the war in Vietnam, and recently wrote a piece on Culture War for the leftist Huffington Post.None of these ad hominem (feminam?) observations disqualify "Evil," but they set it in context. My problem is that throughout the book, Neiman refers only to "the problem" of evil.A problem is a question, either more simple or complicated, that has a specific, concrete answer, that either you will eventually attain to, or at least someone else has or could. But evil is not a problem.No matter how long one studies it, one will never be able to completely conceptualize or lucidly verbalize evil.That is why I think the best category under which to analyze evil is 'mystery. 'Of course, those of the same enlightenment background as Dr. Neiman will balk at such a word, presuming that they have banished 'mystery' to its primitive corner.But it is possible to use the word mystery not about a 'whodunnit' novel, and not about a religious cultic experience.A mystery is a profound philosophical question, like love, death, personhood, etc., about which one can do much reflection, gather much light, rule out absurd propositions, but which ultimately cannnot, due to the nature of the subject, be encapsulated in concepts or contained in words.That was the enligtenment's dream, dashed upon the rocks of the Judaeo-Christian mystery of original sin, as best observed at Auschwitz and Hiroshima in the so-called modern 20th century. Typical of this genre, on p. 335 Neiman equates the Middle Ages with the Dark Ages, an undergraduate mistake, yet one normal for those who think everything prior to Spinoza was bad, everything after him was good. Methinks that enlightenment scholars, even at this very late date, doth protest the death of God too much.That may be true on the narrow strips of land of western Europe, and both coasts of the USA, but virtually nowhere else.Nieman, and other fans of the enlightenment (which brought our culture the lovely French Revolution, whose grandchild was the Bolshevik) seem wistful that we are now in the post-modern age, when we take the positive insights of the enlightenment (of which there are many), and blend them with the perennial insights of Jerusalem, Athens, and Rome. Modern thought? :More like recently irrelevant. Not being a philosopher, I write only to offer a thought about the apparent view that "unintentional" or "banal" evil is not "evil. "Although I have heard it stated in the abstract before, seen in the present context, that view is quite shocking. Assuming a fully competent actor, evil should be defined not only according to the intentionality of acts (perhaps limited to acts whose nature or consequences are defined as evil either by spiritual or natural law on the one hand or positive law or moral authority as "evil"), but also, alternatively, in neutral terms of moral responsibility, without regard to the actor's subjective state of mind.To say that every person has moral responsibility is to say that each person has an obligation to know, or at least to investigate and decide upon, the moral quality of his or her acts, particularly whether the acts' nature of consequences are subject to being characterized as evil.An act done intentionally that would be evil because of its nature or consequences thus would be evil for the same reason when done without reference or regard to its moral quality. By comparison, we award punitive damages in many jurisdictions not only where a party's acts are intentional, but also where they are done recklessly, which includes indifference to the rights and interests of others.It is true that many jurisdictions distinguish between malice murder and other types of killings based on the actor's state of mind, but pressing that distinction into service to justify a definition of evil assumes that only intentional murder can be called evil. The Holocaust of course involved intentional killing.Factually, evil was inherent in the Holocaust as an event of history because of the intentionality of the leaders of the Third Reich; analytically, even assuming that some of the instruments of the Holocaust were "mere cogs,"the suggestion that their acts were not evil ignores moral agency and responsibility in at least two senses:the moral responsibility that is an inherent element of our "humanity"; and the moral agency that such persons almost certainly possessed and exercised in a manner that would be evil under both historical spiritual and modern utilitarian definitions.It is plausible to suppose that the "mere cogs" were indifferent to the nature or consequences of their actions, and in that case the evil inheres in that refusal to exercise moral responsibility.Neither being an historian, I would have to account for any evidence to the contrary, but the idea that the mere cogs were somehow ignorant of the nature of their actions (whether signing the orders or turning on the petcocks) lies on the laugh-line somewhere between implausible in context and ludicrous on its face.But even assuming that that might somehow have been the case, the evil lies in the mere cogs' failure to exerise moral agency. The above may resolve to a definition of evil that turns on the nature or consequences of the act under scrutiny, in the same sense as the early tort of trespass was defined in the English common law, solely according to its consequences. It may well be that my starting-point of non-intentionality may be an artifact of my responding to a proposition that turns on intentionality, and that the "nature or consequences" of an act may suffice to justify labeling it as "evil. "Such a test might be structured according to deontological values or, as Professor Neiman's proposal for the "modern rule" appears to be, utilitarian values.The former would seem to permit a priori judgments, whereas the latter might now.Beyond the taking of life (and leaving aside the death penalty and just war, which present other issues, it is useful to consider whether the following, for example, amount to evil:environmental damage of sufficient magnitude; and independent, state-sponsored, and state-perpetrated terrorism (the last according to the French usage of "terroriste" during the French Revolution, being a reference to government officials engaged in official acts.At the end of the day, to talk about 9/11 as an "evil" act apparently without concomitant consideration of whether some of the responses thereto have been "evil" is a best a serious defect in the development or application, or both, of a definition of evil, in the same sense that the penchant of United States officials to talk about the "evil" of terrorism without a searching inquiry directed at their own actions is a serious defect of politics and authority. my book was one day late, i contact them and they refunded my shipping money back. the book was in an excellent condition actually it was better than what i expected to be.if you have any problem they will respond to you within 24 hours.i liked their service. 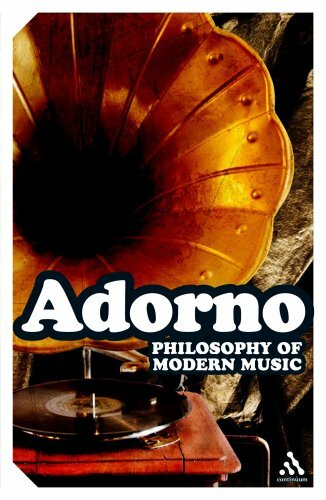 Adorno's Philosophy of New Music gets five stars. This translation gets two stars. It's notoriously unreliable and full of errors. Instead, buy Robert Hullot-Kentor's translation titled, "Philosophy of New Music" (he explains why this is the correct translation of the title rather than *Modern* music.) That edition is far superior with an amazing introduction provided by the always perceptive Hullot-Kentor. Read Adorno as he was meant to be read. Don't buy this translation. Still a nourishing display of conceptual power.